3 violins, 1 viola and 1 cello make up this strong and convincing performance sampling string ensemble. With our usual dedicated care we approached this recording with a ‘digital’ composer’s need in mind. Working from the base up we created a diverse collection of phrases to be widely usable in music compositions and large audio productions. Tempo syncing and a wide availability in all keys has been top priority in this production, to make the product as flexible as possible. For each phrase we’ve also included an octaved overdub (recorded separately), mapped to the keyboard an octave higher than the original to easily layer them and make it a breeze to build the tension in your compositions and to instantly fatten the sound and expand your orchestra. We’ve invested a massive amount of resources, professional skills and musical talent to create something very unique and usable for the modern day composer and producer. We’re convinced we’ve achieved our goal with this large sample pool and hands-on users interface. We also invested in multi-formats so the range of sampling possibilities is extended past the proven Kontakt format. 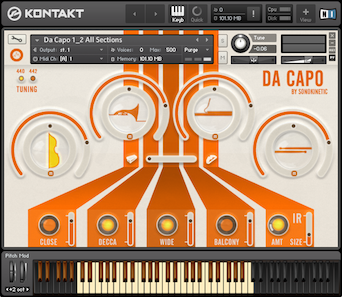 Although we focus on the user interfaces of Native Instrument’s Kontakt format other core sample audio formats are available to fit every need and make this collection widely accessible for every producer and composer. Sultan Strings will give your production the creative edge you’re always looking for and let it excel in originality and authenticity. 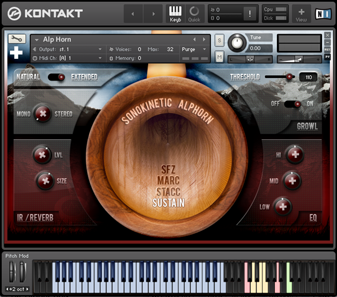 Sonokinetic has established a name as one of the best price value-quality sampling producers and with this we like to underline that statement. We stick with our unbeatable pricing module and high quality sampling. This is an absolutely must-have and hard to resist performance strings library. 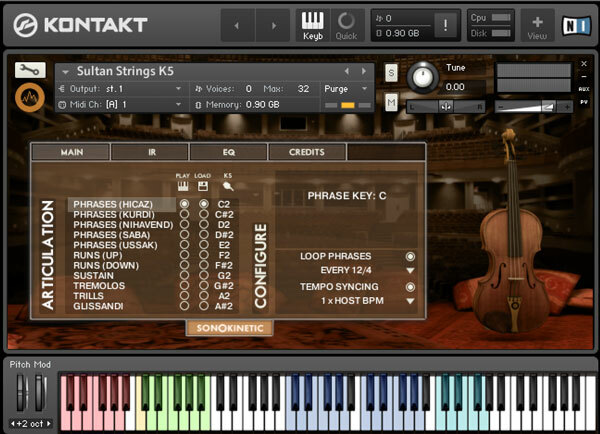 For your convenience, Sultan Strings contains all the articulations you could ever need in a single NKI instrument. You can switch between the different playing styles either by clicking its name from the MAIN panel, or by pressing its respective keyswitch on your MIDI controller. The keyswitches default to the lowest octave on an 88 key keyboard. However, the instrument can be completely customized to suit your needs and keyswitches can be reassigned. Simply click the respective articulation’s key in the column and it will change to a ‘!’ symbol and flash. You can now play a key on your keyboard and the keyswitch will assign to it. You can use this configuration method to suit the instrument to your needs. 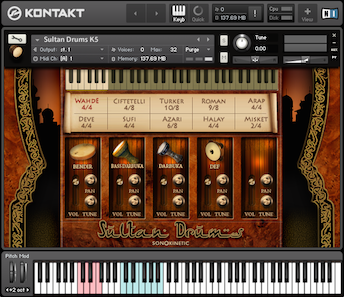 Sultan strings was sampled to take advantage of Kontakt’s ability to synchronise samples to your sequencer’s tempo. You can configure this aspect on the right of the instrument’s main panel. LOOP PHRASES allows you to specify the timing with which to repeat phrases when holding down a key. It defualts to 8/4 (a loop will play every 8 bars). It can be configured to 12 or 16 bars. TEMPO SYNCING enables and disables the syncronosation script. When it is disabled, you can pick a custom BPM using the drop down underneath. 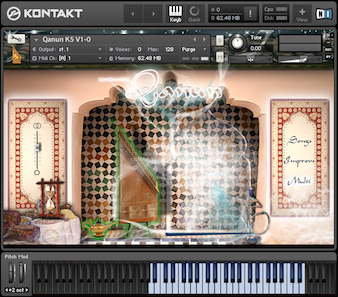 The EQ panel allows you to shape the instrument. You are able to easily configure the frequencies, bandwidths and gains as required. Values will appear as you drag sliders. You can also completely bypass EQ. 3 impulse responses with configurable parameters: 16 bit wave format. Sultan Strings Reference manual (pdf). PLAY: Click this to change to this articulation. LOAD: Click this to toggle if this articulation is loaded to memory. You can unloadarticulations not used to save memory. KS: The keyswitch used to activate this articulation. You can change this by clicking the key label and pressing a key on your keyboard while it is flashing. SUSTAIN DYNAMICS: Toggle whether or not dynamics are controlled manually. You can customize which CC control dynamics by right clicking below, choosing ‘Learn MIDI CC# automation’ and moving the desired slider or knob on your controller. SUSTAIN RELEASE: Toggle whether sustain samples have release notes. TEMPO SYNCING: Toggle whether the phrase and runs are tempo synced. Click this to change it. 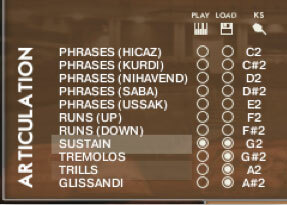 When on, phrases and runs will be stretched to fit your sequencer’s tempo. 1 X HOST BPM: Allows you to configure how the tempo syncing scales to your sequencer’s BPM. It can be changed by clicking. LOOP PHRASES EVERY 8/4 : Toggle how often phrase should loop when you hold down a note.